Happily Ever Rushed: Newborn Cloth Diaper Baby Shower! I am excited to be working with Conservamom on this giveaway. There are so many wonderful prizes from amazing sponsors. Conservamom is expecting her 5th baby and in honor of that is hosting this amazing giveaway. Please remember to stop by and visit your hosts and co-hosts and congratulations to Conservamom. What is a blogger to do when she's expecting the birth of her 5th little blessing? Hold a baby shower event to celebrate this exciting time! Conservamom is expecting the birth of 5.0 and she's so excited waiting for his/her arrival (She's Team Green), that she wanted to shower her fans with prizes as well! Because she's been blessed with trying out so many great brands it was only fitting that she pass on the fun and excitement to her readers with an amazing baby shower event. 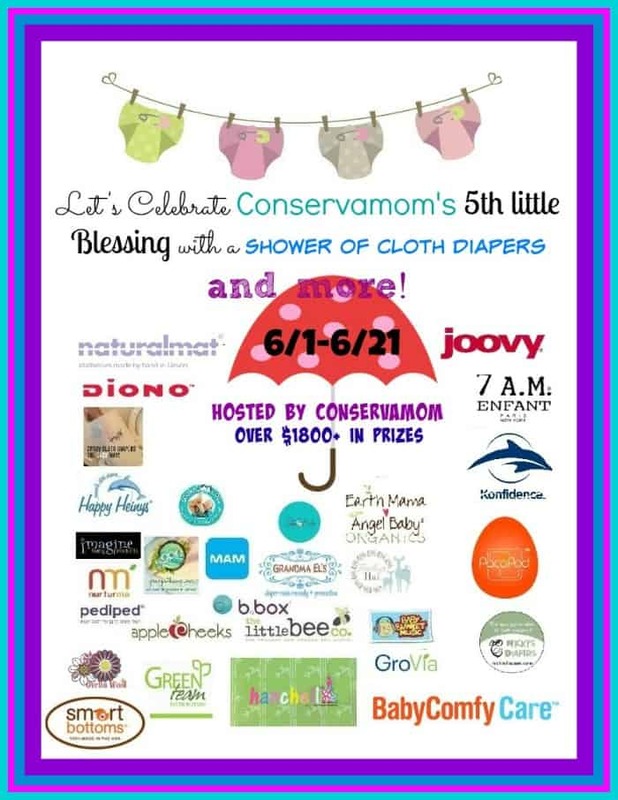 She's teamed up with over 29 of the best Baby & cloth diapering companies around to bring her readers the chance at some amazing prizes! So are you ready to find out what the prizes are? Diono Radian RXT car seat $359.99 Diono designs, manufactures and markets travel solutions for the children of today’s families on the go. Diono car seats and travel accessories are safe, reliable and easy to use. One of the leading car seats on the market who's safety standards are leaders in the market. You can check out Conservamom's review here. Spray Pal Diaper Sprayer & Spray Pal $75 Spray Pal is a must for any cloth diapering parent. Spray Pal is a cloth diaper splatter shield you can use with your diaper sprayer to clean the EASY way. You won't just fall in love with the product but with the Family behind Spray pal. Check out this innovative product sure to make your life so much easier when spraying your diapers. Happy Heinys Mini 1-size & Newborn diapers $37.90 Happy Heiny diapers is an line of quality cloth diapers that was purchased by Super Moms Katie and Addie in the spring of 2013. Katie is a wife and mother of five and Addie is a mom of three. Together their passion for natural parenting has been channeled into this wonderful diaper. With such a variety and selection including a unique micro mini that can be used on babies as little as 1-3 pounds, they've made diapers to help your little ones grow in cloth from birth and beyond. Imagine Diapers (3 newborn diapers) $41.82 The Imagine All-in-One Cloth Diaper is lined with a super soft fleece inner, keeping baby dry, complimented with a waterproof PUL outer, keeping leaks in. The included fleece-lined, 4-layer microfiber soaker pad snaps into the front of the diaper for added absorbency, but is removable for a quicker dry time after wash. The gentle leg casings prevent leaks while keeping your baby comfortable. The Imagine All-in-One Cloth Diaper is available in 5 beautiful colors and comes in either snap or hook & loop closure. The snap closure features high quality, durable snaps and the hook & loop closure feature large folding tabs for easy laundering. Zookaboo Diapers Five newborn (7 to 10lbs) cloth diaper covers $60.00 Zookaboo is a small-batch manufacturer of handmade baby and children's apparel and cloth diapers. Their quality is unsurpassed using the trendiest prints and fabrics in the market. Zookaboo brings forward gorgeous creations for babies and kids that will have you wanting more! These gorgeous covers are PUL lined with fun outer cotton prints. All have double row of snaps. Ovella Wool Balls 6 pack of Dryer balls $31.95 Ovella Wool features handmade wool products. Located in Midland, Michigan, their wool is from local, farm-raised sheep. They hand dye their wool in small lots, and take pride in the products that they offer. Don't forget to check out these quality, beautiful wools and make a change in the right direction when it comes to saving money and living eco-friendly. Nicki's Diapers- 3NB Bamboo $41.85 Nicki's Diapers Newborn Bamboo All-in-One Cloth Diaper is lined with buttery soft, yet incredibly absorbent bamboo with a complimenting waterproof outer. It fits approximately 5-13 pounds. Green Path Baby: 2 Little Joey Diapers $29.95 GreenPath Baby is a mom-owned cloth diapering store. They are dedicated to helping their customers discover the best cloth diaper as well as natural products for babies at every price point. 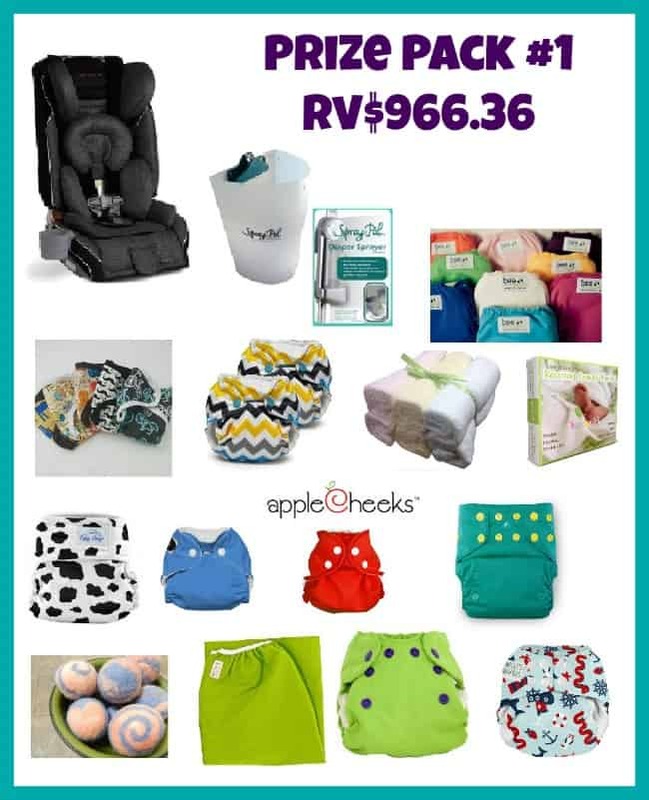 They currently offer cloth diapers, baltic amber necklaces, woven wraps, detergents, and a great variety of natural products for moms and babies. Everything you need in one place! They believe in mindful parenting, green living and cloth diaper advocacy. Apple Cheeks -1 Little Bundle $28.95 Apple Cheeks are a fabulous washable diapering system. The ecologically-minded business women behind these gorgeous diapers really know what they are talking about when it comes to washable diapering not only from their own personal experiences, but also because they have listened to their customers over the years. This Canadian-made system is one of the trimmest, best-fitting diapers on the market, backed by unparalleled customer care! The Little Bee Co. New Born Diaper Package $105 The Little Bee Co. is a modern cloth diaper company dreamed up by a mom with a vision to make a change! Little Bee Diapers carry the cutest selection of diapers around with various systems that fit your child's and cloth diapering needs, not only will you find some fantastic style diapers but some gorgeous colors as well. Little Bee is a leader in giving back. For every diaper sold they donate a diaper to a baby in need. 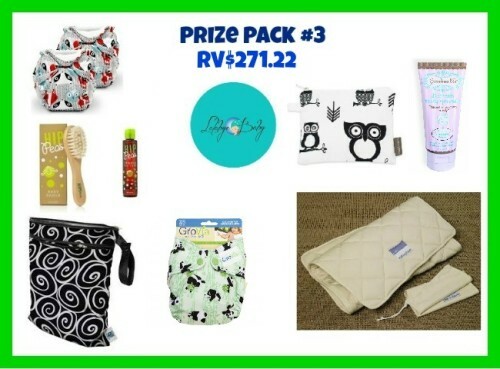 Zephyrhill Blog:Funky Fluff Real Teal Stay Dry Diaper with two inserts ($20.99) Zephyrhill Blog is a helpful, friendly place for families to learn, swap experiences, and just have fun. This super mother of seven kids here on earth and one in Heaven is filled with some great reviews, recipes and so much more! Follow her on all the fun! Smart Bottoms : Newborn Diaper & Pail $34 Smart Bottoms offers an organic cloth diapering system that is 100% made in the United States. These high quality products are available at a reasonable price, so all families can provide the finest for their little ones. You can find the cutest prints and sleekest AIO in the market made with amazing quality! Make sure and check out this amazing family-owned business! Hanchell Baby Swaddle blanket set & Bamboo Washcloths $99.00 Hanchell Babies is committed to making your life easier by providing you with a range of high-quality products which you can trust time and time again. They understand you won't compromise on the needs of your baby and neither will they. They've researched, developed and commercialized leading baby products which give you peace of mind and meet your needs in the care and love of your baby. They are continuously adding new products to their line so don't miss out on all the exciting things going on! Their promise is to not sacrifice quality in the pursuit of profit and to always use rigorous selection criteria to either eliminate products that do not meet their standards or identify what must be done to improve the product they bring before you! 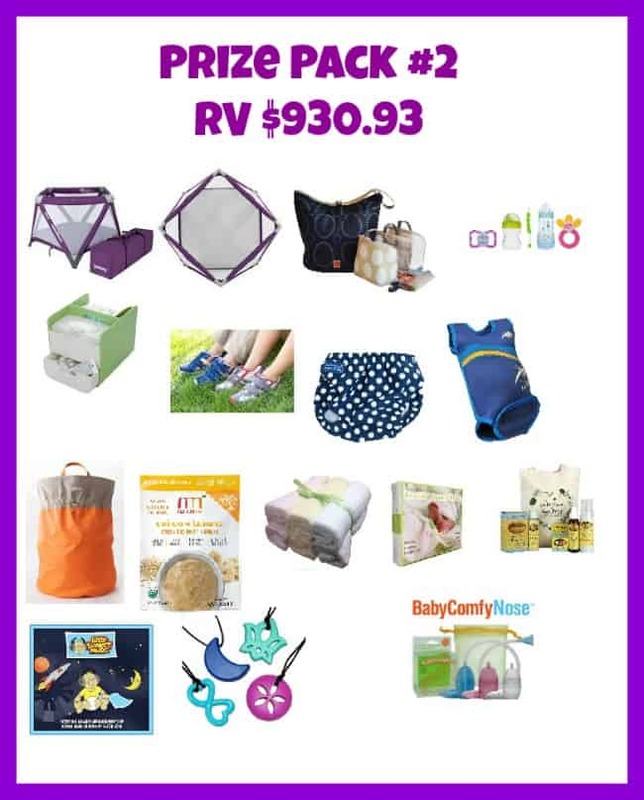 Joovy Moon Room $189.99 Joovy [joo-vee] is a family gear company offering lifestyle products in eight key categories. The Joovy product philosophy incorporates modern, functional, high quality features at value-driven price points with an emphasis on durability and utility. Since 2005, Joovy has created products for the contemporary family on the go. The Joovy catalog features exceptional, trend-setting products manufactured with high quality components and materials, ensuring quality with every purchase. You can check out Conservamom's Review of the Joovy Moon room here. 7A.M Enfant Hamper Bag $50 Founded by French designer Rebecca Campora, 7 A.M.® ENFANT offers a wide selection of versatile, urban and stylish baby accessories combining good design, fashion and versatility. Always focused on designing accessible lines, Rebecca Campora’s philosophy is to meet parents' desires and needs by anticipating the trends and movements. Her cutting edge, yet simple vision has reinforced the strong identity of the brand now highly successful on all continents. You can check out Conservamom's Review of The 7 A.M Enfant Hamper Bag here. NurtureMe $55 Prize Pack Includes: 4 bags organic quinoa baby cereals,1 pouch each nurturmeal blend + nurtureal quinoa, 4 yum-a-roo toddler snacks,1 re-useable eco pouch,1 BPA free baby spoon, 1 coupon, 1 informative quinoa bookmark NurturMe is the first and only family of certified-organic, dried fruit and veggie meals and snacks created to nourish healthy growth and overall wellness in little ones. Bursting with vital nutrients and fresh organic flavor, NuturMe’s Quinoa infant cereals, dried NurturMeals baby food and Yum-a-Roo’s toddler snacks help parents feed their children better from first bites to first steps, and everywhere in between. NurturMe provides innovative and sustainable options for busy, modern parents to help ensure their children are getting the nutrition they need to live a yummy life – including the first 100% pure quinoa alternative to traditional rice cereals, dry pouch infant meals that can be mixed with breast milk or formula for added nutrients, and healthy toddler snacks that deliver 1.5 servings of fruit AND veggies in each pouch. Made from specially selected super fruits and veggies that are quick-dried in order to preserve freshness, flavor and vital nutrients, NurturMe baby and toddler foods are certified organic, gluten-free, non-GMO and kosher, with no added preservatives, sugars or salts. Good for baby and Mother Earth, NurturMe’s dried fruit and veggie foods are super lightweight and made in the USA, leaving a smaller carbon footprint on our planet than the other options found in the baby aisle. Additionally, every 3-pack box of NurturMe Eco-Pouches keeps more than 45 plastic baby food squeeze pouches out of our landfills. Please visit nurturme.com for additional information, including pricing and where to purchase NurturMe products. Visit us at Facebook.com/nurturme, Twitter.com/nurturme and Instagram Instagram - @NurturMe_ http://instagram.com/nurturme_ for special promotions, recipes, new products and more. MAM USA $75 Prize Pack MAM produces standard-setting baby products. MAM combines technological innovation, medical function and contemporary design to develop superior baby care products that support a baby’s development from day one. Since MAM developed its first soother in Vienna in 1976, it has evolved to become a global authority on baby care product design and quality. Today MAM products are used by families in over 50 countries and on five continents. To find out more and view MAM’s baby care range of award-winning pacifiers, bottles, cups, teethers, oral care items and coordinating accessories visit www.mambaby.com. Pacapod Trio Bag $140.00 No matter where you wander, everything’s in place with PacaPod, the only baby changing bag on the market with a unique and ingenious 3- in-1 organization system. Inside every PacaPod is the brain behind the bag, a Feeder and Changer pod to hygienically separate feeding from changing. PacaPod’s award-winning bags work as a designer baby bag, cool bag, mini changing bag and changing mat all rolled into one. Founded by mom and clothing designer Jacqueline Waggett, U.K.-based PacaPod offers more than 15 bag styles in four collections with bags ranging in price from $120-$520. PacaPod can be currently found globally in 13 countries. For more information visit www.pacapod.com. Check out Conservamom's review here. B.Box Essential Diaper Caddy $64 Australia based b.box was founded in 2007 by Dannielle Michaels and Monique Filer. The award winning b.box collection of innovative design led everyday baby essentials includes This light and portable change station ensures you have everything you need for diaper changing wherever you are around the home. Great space saver for apartment living and ideal for two-storey homes. Also makes a great art caddy or home organizer once your little one is toilet trained. Just pop a tissue box where the wipes box goes. BPA, Phthalates and PVC free. Baby Comfy Care $12.99 Baby Comfy Nose nasal aspirator uses your own suction to quickly and hygienically remove children’s nasal mucus. Significantly more effective than bulb and battery aspirators because your natural lung suction is so much stronger. The design of the aspirator eliminates any possibility of contact with mucus and germs. Insert a tissue into the aspirator as a filter so there’s nothing else to buy. The unit comes with two nose tips: standard and newborn. Medical grade soft nose tip and mouth piece. The mesh storage pouch keeps all the pieces together in the dishwasher, then hang to dry and it’s ready for the diaper bag. Three colors options are ideal for siblings and multiples. BPA and phthalate-free. ZenRocks 2 necklaces $30 ZenRocks are a stylish new twist on teething jewelry for mom and baby. Zen-Rocks features completely new, never before seen or produced designs, made from non-toxic silicone. Hanchell Babies is committed to making your life easier by providing you with a range of high quality products which you can trust time and time again. They understand you won't compromise on the needs of your baby and neither will they. They've researched, developed and commercialize leading baby products which give you peace of mind and meet your needs in the care and love of your baby. They are continuously adding new products to their line so don't miss out on all the exciting things going on! Their promise is to not sacrifice quality in the pursuit of profit and they will always use a rigorous selection criteria to either eliminate products that do not meet their standards or identify what must be done to improve the product they bring before you! Natural Mat Top Mat $135 The Natural Mat Company was founded in 2000 in Topsham in Devon, by Mark Tremlett and Peter Tindall, who as keen sailors both became frustrated with the poor quality of synthetic mattresses found on boats. Mark and Peter decided to look for an alternative and found natural fibers to be a more superior substitute for boating. With their knowledge and expertise they quickly developed a business making mattresses for yachts and motor boats. With the arrival of Mark’s first child, they quickly identified a need for a natural offering for babies. With a mission to develop the perfect natural sleeping environment for babies and children, Mark and Peter set to work to create a range of pure natural fiber mattresses. After nine months, they were proud to launch the first range of natural baby mattresses. The handmade range includes organic coir, natural latex and mohair mattresses from cribs through to children’s beds. Each mattress provides parents with the peace of mind that babies will have a safe and restful night sleep on the highest quality natural fibers available today. Natural Mat manufactures and distributes mattresses around the world from its base in Topsham, Devon. Lalabye Baby Cloth Diapers Baby Gift Card $25 These diapers are one size pocket diaper designed to be used from newborn through potty training! Using 100% Natural Bamboo Fibers and TPU (waterproof fabric) Lalabye baby’s diapers are among the best. These diapers are designed in the USA and manufactured overseas. They are custom created and designed with your baby in mind. I have to warn you though, these diapers are addictive and have a huge fan following, so be ready to fall in love with Lalabye baby's amazing diapers! Grandma El's Diaper Rash Cream $10.45 Grandma El's Diaper Rash Ointment is a pediatrician recommended healing ointment. Used as directed with every diaper change it will help to prevent, protect and heal diaper rash. The fragrance-free ointment soothes baby's most sensitive skin while keeping it protected. It is absolutely the most effective diaper rash treatment product available today. Grandma El's helps to reduce the redness, pain, itching, and irritation associated with diaper rash. It creates a breathable, softening protective barrier which prevents wetness from coming to contact with the skin, thereby keeping your baby comfortable. An application of Grandma El's will help protect your baby keeping them comfortable while sleeping, playing, and exploring. Use Grandma El's with your next diaper change. Grandma El’s has shown positive effects in helping with the following: Eczema, Heat Rash, Minor Burns, cuts, and scrapes, Sun Burn, Cradle Cap, Cracked Heels, Chapped Lips and Cheeks, Post-Tattoo Treatment. Green Team Enterprises- HipPeas Craddle Cap Care kit & Brush Green Team sells eco-friendly Mom and Baby products to US Retailers. Visit www.GreenTeamDistribution.com to open an account for your store. Hip Peas is a line of fun, kid-friendly hair and skincare products that contain safe and natural ingredients. What’s more, these products are effective. I would love to win any of them!! They are all amazing! Thanks so much for the chance!! CONGRATULATIONS Conservamom! It's obvious you know what a baby needs and is great that you're sharing all these.